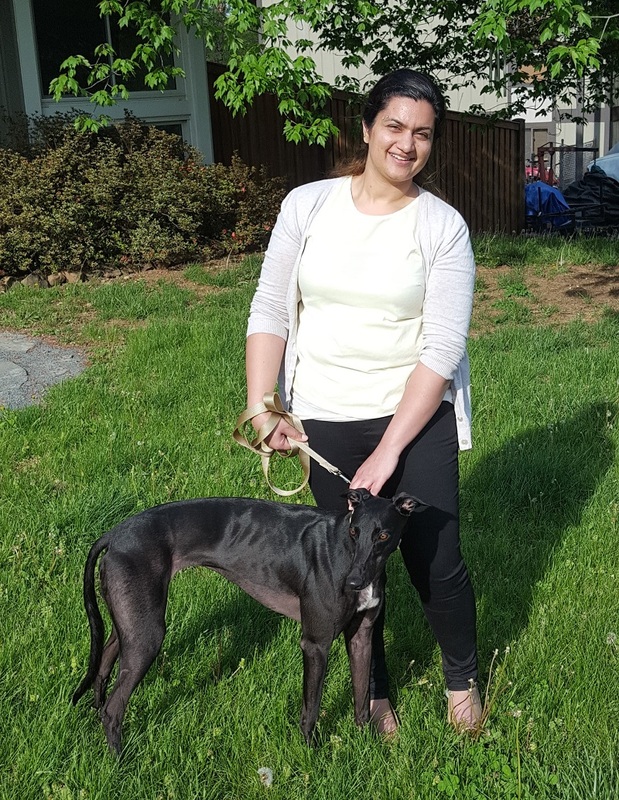 BRGA is excited to say CONGRATULATIONS to our 2 newest Greyhounds, Saoirse (seer- sha; It's an Irish name meaning "freedom" ), formerly Victori Bonasera "Sera" and YOLO Country, now called Ace! 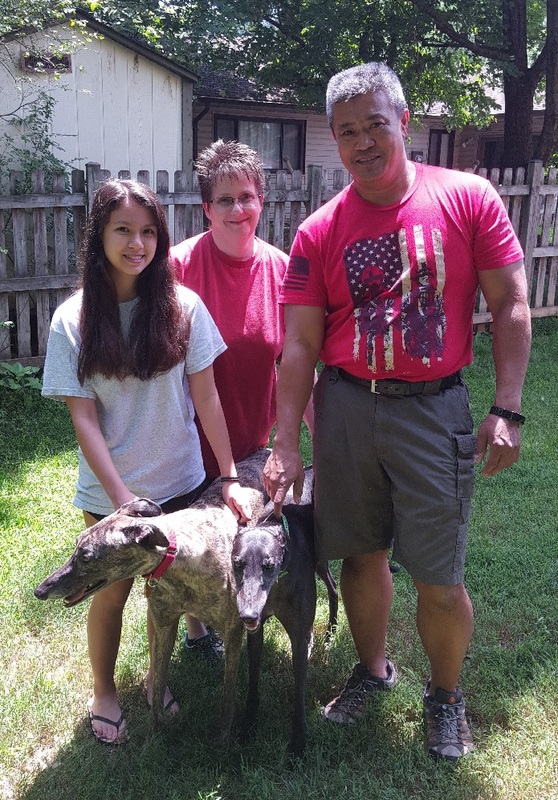 Saoirse and Ace managed to "hitchhike" up to VA with 2 members who were driving down and back to FL. Always room for one (or two) more! Alexis and Scott with their son and daughter (not shown) also waited a long time for just the right special boy, Ace, to come to VA and be a part of their family with their cat. Ace was a wonderful traveler along the way and helped guide the drivers to his new home. Ace has taken to his new beds and learning the ropes in the family's home. Congratulations to Ace and his wonderful family! Saoirse. The phrase, "It takes a Village" is so true with this special girl. She was a BRGA sponsored broken leg dog. With the help of multiple volunteers in FL, Saoirse was given lots of love and time to heal prior to her adoption. The family says she is already giving lots of kisses. and stays right next to them on her bed with her blankie and her bunny. She is an amazing girl! BRGA is thrilled that she is finally in her forever home! 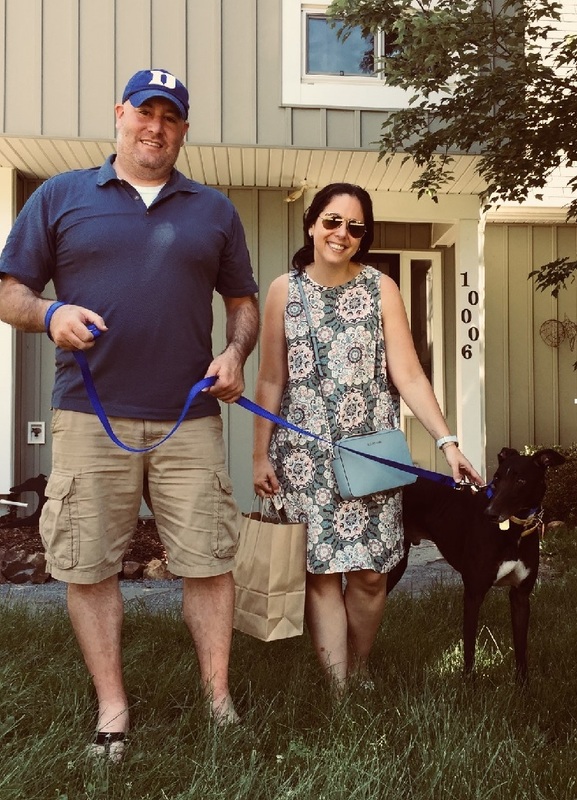 Kristine and her husband Jerome were so excited to meet Marley and add her to their family with their Doberman at home. Marley loves to run, despite the fact that she has a short tail. She's very smart and showed off her skills at the graduation. The family says she was so easy in the car heading back to VA! Marley is excellent addition to our Hardee group! Rachel (pictured with friend, Caleb), her daughter, Elizabeth just adopted Carl. He's a wonderfully energetic and smart boy loved by his trainer and now loved by his new family. Carl has immediately bonded with Elizabeth and enjoyed the ride back to VA. He's adjusting to his new home and getting to know the cat. BRGA is thrilled to have you in the "pack"! RINGING IN THE NEW YEAR WITH OUR NEWEST ADOPTED FAMILY! 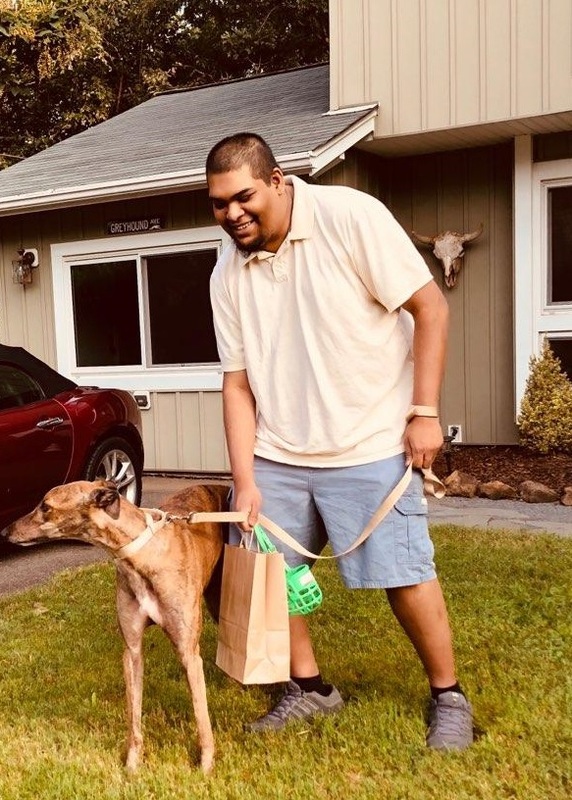 On January 1, 2019, Patches, one of BRGA's sponsored broken leg dogs finally has his new home! Andrew and Christine had originally applied to foster a Greyhound as company for their Grey at home. When they heard about Patches, a gorgeous blue fawn male, they said, YES-we want him in our home! Patches has been recovering in fabulous foster care since November. 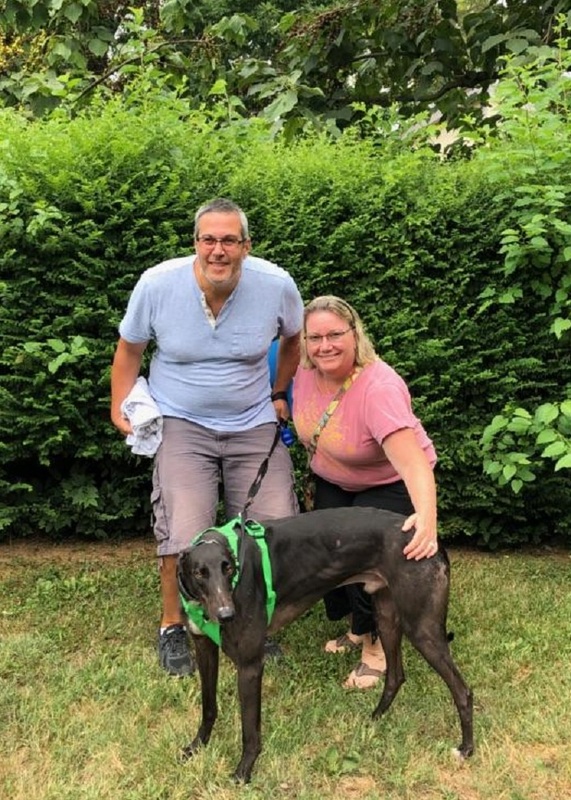 Finally Christine and Andrew could not wait 1 day longer and took Patches home to enjoy the couch and his new Greyhound friend! Congratulations to Christine, Andrew and Patches!! WHAT A HAPPY NEW YEAR FOR ALL! Another Hardee Graduate and a Plus 1 !! 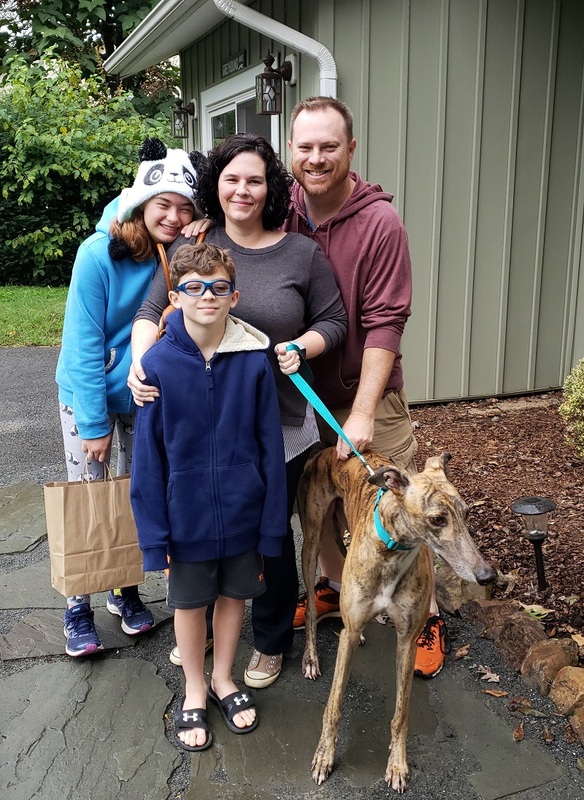 Congratulations to Jane, Paul, Kate and Claire with their new "siblings", Sunny (white and fawn) and BRGA's recently sponsored broken leg dog, Lenny! 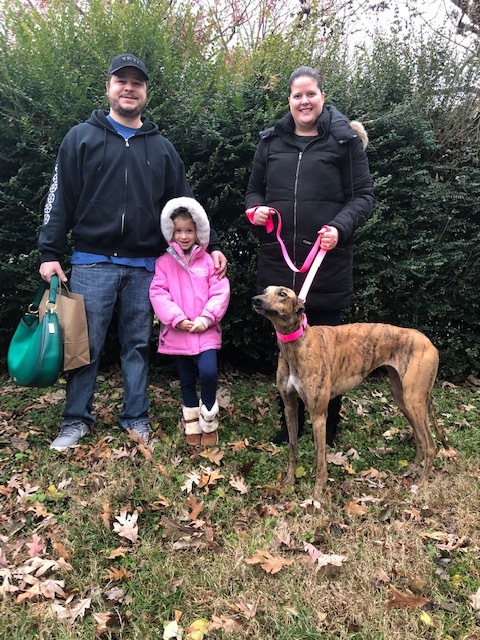 The family waited patiently for several months to take the trip to FL to pick up Nevaeh, now called Sunny from the Hardee Hero Hound program on December 7. Sunny is a sweet, shy little female that was loved by her trainer at Hardee! Jane, Paul and their daughters immediately fell in love with her too! 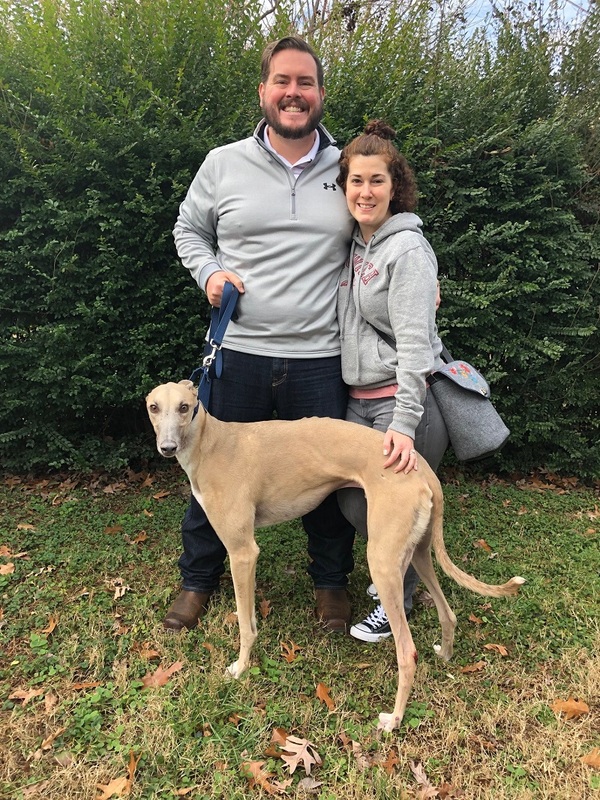 After graduation, the family agreed to take on an extra passenger, Lenny, to be adopted in VA. Well, not halfway through Lenny's ride to VA, the Anderson's knew he was a part of their family! It turns out that Sunny and Lenny are related! Lenny and Sunny have been inseparable ever since! 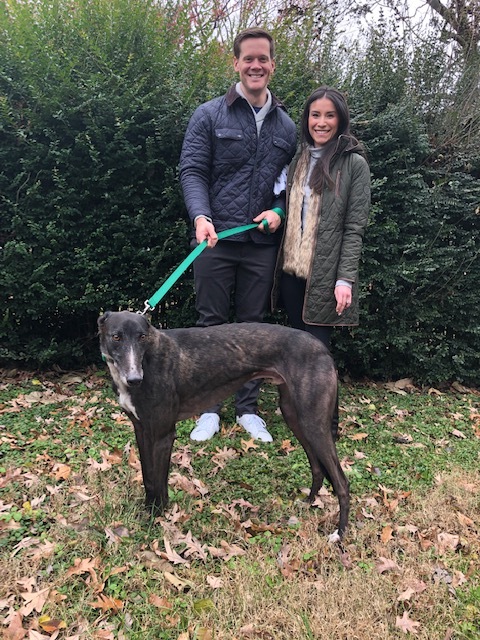 Lenny officially retired with his new family on December 9! Please welcome everyone to the BRGA pack! 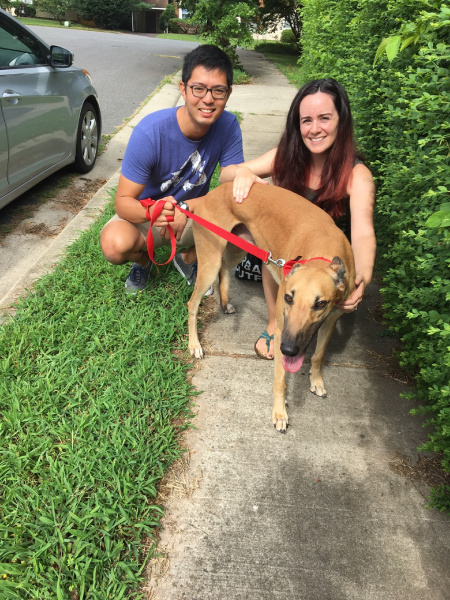 Diana, Karl, and Ashley are officially foster-fails. Cal ran right into their hearts and they never looked back. Congratulations Diana, Karl, Ashley, and Cal!